Julian Norman Writes For Lexisnexis: When Do Pace Powers Apply To Immigration Officers? Julian Norman was recently asked to contribute to the Immigration law analysis section of LexisNexis. 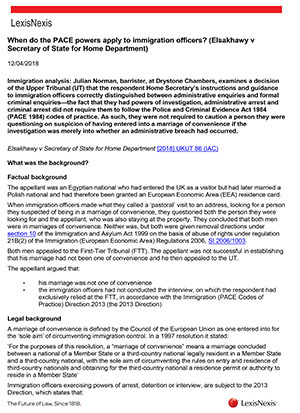 In the attached article, Julian examines a decision of the Upper Tribunal (UT) that the respondent Home Secretary’s instructions and guidance to immigration officers correctly distinguished between administrative enquiries and formal criminal enquiries. In particular, the fact that they had powers of investigation, administrative arrest and criminal arrest did not require them to follow the Police and Criminal Evidence Act 1984 (PACE 1984) codes of practice.